Corporate philanthropy is an important part of any nonprofit’s fundraising strategy. From matching gift programs to volunteer grant policies and everything in between, organizations need an easy way to help their donors learn about their employers’ corporate philanthropy programs. That’s where matching gift databases come in. 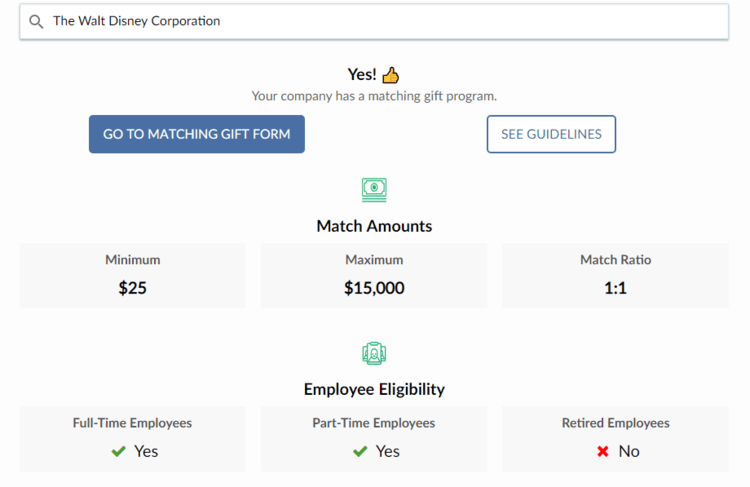 With the help of a matching gift database, a nonprofit can offer their supporters an easy way to look up their employer’s programs and learn how to submit their matching gift request. But how can your nonprofit decide on which matching gift database to choose? Our top choice for a matching gift database. The history of the matching gifts industry. The comprehensiveness of each database. How many forms each database had. How up-to-date each database is. The search functionality of the database. How easy it was to use the data. If you’re ready to learn more about these providers and how they can empower your fundraising strategy, read on! 1. Our top choice for matching gift databases. Even though every database has its own strengths and weaknesses, we found that there was one overall champion of the matching gifts database game: Double the Donation. In every category we considered, Double the Donation was either tied neck-and-neck or was found to be more useful than the other providers for what a nonprofit might need. One of the other things we loved about Double the Donation is the range of packages they offer: basic and premium for just the matching gift database, as well as 360MatchPro for larger nonprofits. 360MatchPro is a fully automated matching gifts platform and database, so that a nonprofit can be sure that they’re taking advantage of every matching donation opportunity. Employing Double the Donation’s matching gift database in conjunction with any of your other online donation tools is a surefire way to increase the amount of matching gifts you receive. Next, we’re going to break down how we came to this conclusion. 2. History of the matching gift industry. There are four main players in the matching gift database field. While they all provide slightly different services and features, the end goal is the same: to help nonprofit organizations take advantage of corporate philanthropy and matching gift opportunities. So what are these companies, and how long have they been operating in the matching gifts space? HEPdata is a matching gifts database provider and wealth screening service. They’re the oldest player in the industry, having been founded by Steve Hafner in 1997. Double the Donation, the company that created 360MatchPro, is a corporate philanthropy database and matching gifts automation provider. It was established in 2010. Amply is a matching gifts automation provider. They were founded in 2010 as DonateDouble, but recently rebranded themselves as Amply. Blackbaud, who is a major player in the nonprofit technology space, has their own matching gifts database called MatchFinder. MatchFinder has been a feature of Raiser’s Edge and Blackbaud CRM for years (potentially since 1999 but it’s not clear). In terms of who has been around the longest, HEPdata wins. And while HEPdata’s experience in the industry is certainly a benefit, we found that age wasn’t the most important indicator of strength for a matching gift database. Let’s keep going. 3. How comprehensive is the matching gift database? What we learned about the four matching gifts providers is that only Double the Donation, HEPdata, and Blackbaud have their own databases. It seems like historically, Amply has used HEPdata’s database to power their matching gifts automation services. So of Double the Donation, HEPdata, and Blackbaud, which has the most comprehensive database? We chose a sample of companies with the best matching gift policies and then searched for those policies on each of the databases. Alternate spellings or variations of companies and brands. This ensures that a person who works for Disney World would be able to find their company’s policy no matter if they search Disney, Disney World, Walt Disney World, or any other variation someone could think of. This is where Double the Donation and HEPdata came out on top over Blackbaud. They both had over 20,000 entries in their database. Since Blackbaud doesn’t specialize in matching gifts like Double the Donation and HEPdata do, its database isn’t as comprehensive. However, Double the Donation gained an edge over HEPdata because it included a few major corporations that HEPdata was missing. Overall, Double the Donation’s matching gifts database covered over 99% of donors with matching gifts eligibility. That means that 99% of donors who would be able to complete a matching gift for your nonprofit could find their forms on the Double the Donation database. For this section, Double the Donation is the winner. Bonus! 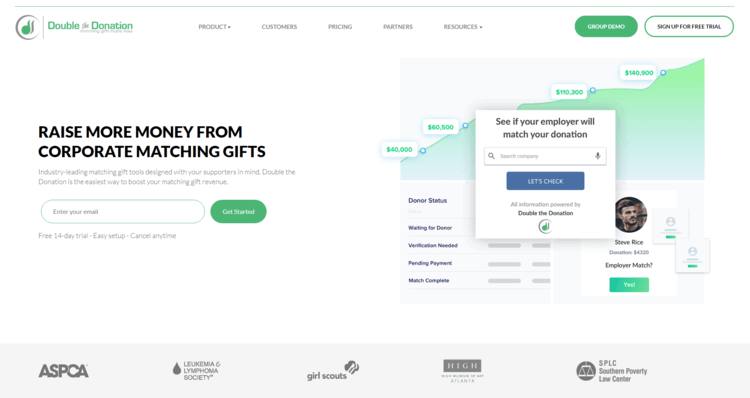 Matching Gifts Best Practice: To maximize the visibility of your matching gifts database, embed a plugin version into your online donor thank-you letters. 4. How many forms does each matching gift database have? To determine which database had the most actionable forms, we sampled a number of large companies that represent the most matching gift dollars and compared the results side-by-side. To do this, we searched for the company in the database, determined whether or not they had a matching gift program, and then seeing if the database had the form itself or provided the correct link to the form. Currency: if the links to the forms were still live. Accuracy: the links took us to the pages that we would need to submit a match request. Convenience: the number of electronic forms included that a donor could fill out from home, if possible. Again, Double the Donation was the winner. They had more online donation forms than Blackbaud or HEPdata, as well as more forms in general and fewer dead or inaccurate links. Bonus! Matching Gifts Best Practice: Every nonprofit should be incorporating donor and prospect research into their fundraising strategy. Take this tactic to the next level by including matching gift eligibility as a data point in your donor profiles. 5. How up-to-date is the matching gift database? Companies’ policies can change, so it’s important that a database has the most up-to-date information available. To determine which database was most up-to-date, we checked a sample of companies with recently updated policies and compared them against what the database provided. Blackbaud – it seems as though their database hasn’t been updated since 2015, since there are some major companies with out-of-date forms and links included. HEPdata – their database was more up-to-date than Blackbaud’s, but there was some outdated information. Amply – they use the HEPdata database, which means that they’re reliant on HEPdata’s updating schedule. Double the Donation – they had the most up-to-date database of the four. Their website is very transparent about their update process. There are ways for employees and employers to submit updated information to the database through the website. Another advantage that Double the Donation had over HEPdata’s database was that the company autoscans the information in the database and removes dead links, email addresses, and phone numbers. HEPdata doesn’t indicate anywhere that they have an autoscan process, so inaccurate data may remain live longer. It seems as though Double the Donation’s online presence, along with the autoscan, helps them keep their database up-to-date. Double the Donation is the winner of this category. Bonus! Matching Gifts Best Practice: Ask your donors about their employer in an effective donor survey to determine who among your supporters might be eligible for matching gifts. 6. What is the search functionality of the matching gift database? We found that there are two types of search functionality in the matching gifts databases. Someone types in a company name and hits ‘enter’. The database brings up a list of subsidiaries and variations with the search term in it. The donor then chooses the correct company or subsidiary from the list. Someone types in a company name. The database autocompletes the search in real-time, suggesting companies to the donor and pulling up relevant information as they type. The biggest drawback to the first option is that it creates the possibility of a variation not appearing, thus making the donor think that the company is not in the database or doesn’t have a matching gift program. It also forces the donor to look through the entries themselves, which can be confusing for employees of large corporations with multiple subsidiaries. The benefits of the second type of search functionality are that it increases the percentage of donors finding the company, as well as completing the search. It only takes 2 steps, as opposed to the first option’s 3 steps. HEPdata, Blackbaud, and Amply all use the first option. Double the Donation used to, but it seems that recently they transitioned to the second option, which is more user-friendly. Double the Donation is the winner for this section- the streamlined autocomplete option is preferable to the list of variations. Bonus! Matching Gifts Best Practice: Market matching gifts in your email fundraising campaign, so that you can ask your donors for support and inform them about matching gifts at the same time. They might be more inspired to give when they know how to maximize their gifts! 7. How easy is it to use the data from the matching gift database? When it comes down to it, the most important thing about a matching gifts database to us is how well it convinces eligible donors to submit matching gift requests. Since Amply uses HEPdata’s database, and Blackbaud’s isn’t being updated frequently enough to be as useful as it could be, we’re only comparing HEPdata and Double the Donation in this category. They use different strategies to display information after a search has been completed. HEPdata includes information that is useful for donors as well as nonprofit development teams. Unfortunately for the donor, the way that the information is presented can be confusing for someone who isn’t familiar with matching gifts strategies. Double the Donation’s information display is designed just for donors, prioritizing links to forms, company contact information, and the minimum and maximum amounts for the matching gift. While the information that HEPdata includes for the benefit of a nonprofit development officer is useful, we think that, for a donor-facing database, Double the Donation’s strategy is more effective for converting donors. Double the Donation wins this category. Bonus! Matching Gifts Best Practice: Reach out personally to recurring gift donors and ask them to submit a matching gift request. Individualized attention is an important part of donor stewardship. While the other databases are helpful resources, we’ve found that Double the Donation’s combination of functionality, ease of use, and comprehensive information makes it the top matching gift database provider. Matching Gifts: A Q&A Guide to Everything You Need to Know. We here at Re:Charity take our matching gifts seriously. Learn more about making corporate philanthropy work for your nonprofit with our easy guide. Corporate Matching Gift Programs: The Basics. Who better to learn about matching gifts from than the top database provider itself, Double the Donation? Check out their informative guide for a more comprehensive overview of matching gift programs. Solve Your Donation Processing Woes: 7 Tips for Nonprofits. You need donations from supporters to have a matching gifts strategy! Make sure your nonprofit is at the top of its game by reading this guide to online donation processing.